Michael Raftery, Chief Fire Officer; Caitriona McQuillan, Galway County Council; Cllr Tom McHugh, Mayor of County Galway; Eimear Dolan, Galway County Council; and Frank Gilmore of Galway County Council at the launch of the Community Smoke Alarm Scheme. 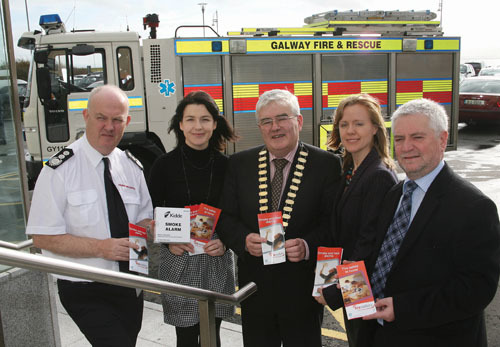 More than 600 homes in Galway are set to receive free smoke alarms in this year’s Community Smoke Alarm Scheme. The scheme, which is a joint approach by the Galway County Council, Galway Fire and Rescue Service, and Galway County Community and Voluntary Forum, is aimed at ensuring smoke alarms ae installed for those who are most vulnerable in society. The alarms have been funded by the Department of the Environment, Heritage and Local Government. Speaking at the launch of the scheme, the Mayor of County Galway, Cllr Tom McHugh thanked the community and voluntary sector for helping to identify those without alarms. Michael Rafferty, chief fire officer with the Galway Fire and Rescue Service, said on average 47 people died each year in domestic fires and that many of these deaths could be prevented by a working smoke alarm. He urged every household to have a smoke alarm and to test it regularly.